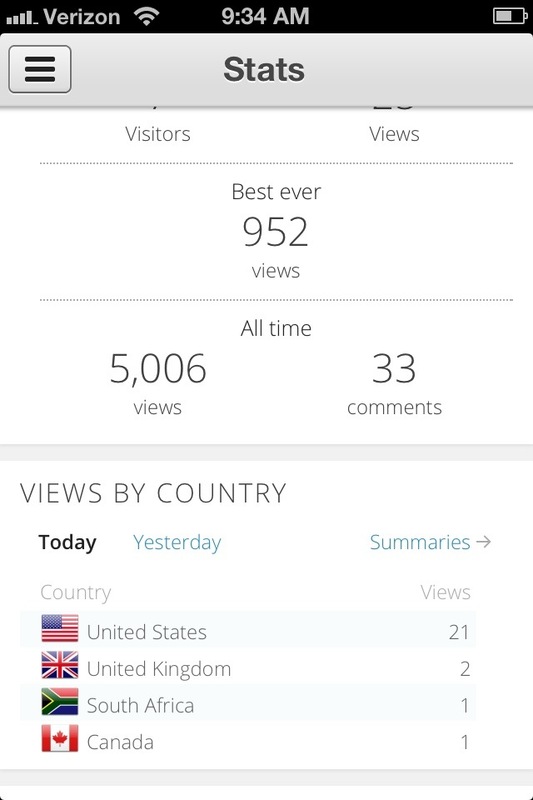 I have been waiting (with bated breath, yes) for this new little blog of mine to hit the magic number of 5,000 visits. Today, It. Has. Happened. Some people just don’t get it. I couldn’t speak. I couldn’t participate. I was timid and scared and the idea of speaking outloud to that room of forty-ish people made my stomach hurt. I knew I could write. I also knew that the things I was writing were unlike anything I was hearing in class, and that terrified me. I don’t know why 5,000 feels like a magical milestone for me. I stayed up late last night waiting for it. It didn’t come until this morning, and as I sit here quietly, with my coffee in front of me and my son making toast, it’s a glorious moment. And it’s mine. I hope everyone gets moments like this. Congratulations! Actually the part I noticed was the 952 best day hits. WoW! How on Earth did you get that many hits in a day?